His early works of the 1950s were generally small and made in clay and plaster, and were described as being of a robust, brutalist and surrealist nature. He started to use fibreglass and colour, and seminal works such as Rosebud (1963), Genghis Khan (1963) and Twilight (1963) brought his work to the attention of the wider art world. King studied modern languages at Christ’s College, Cambridge (1954-57), and sculpture at St Martin’s School of Art (1957-58) with Anthony Caro. 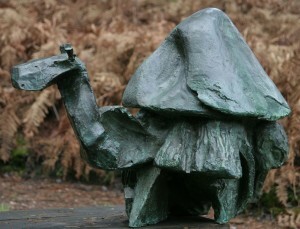 He worked for a year as an assistant to Henry Moore and taught at St Martin’s, a calling he would continue throughout his career. He was a professor of sculpture at The Royal College of Art, and the Royal Academy, a Trustee of the Tate Gallery and was awarded a CBE in 1974. In 1990 he was made a member of the RA and Professor Emeritus at the Royal College of Art, and King was elected president of the Royal Academy from 1999 to 2004. A period of abstract sculpture often combining various materials then turned in the 1980’s to a more figurative way of working before moving on again to make large-scale ceramic vessels using a rough mix of clay and newspaper. Phillip king is an artist of international standing, he represented the UK at the 34th Venice Biennial in 1968, and in 1998 was the first British artist since Henry Moore be honoured with an exhibition at the Forte di Belvedere in Florence.